Cardinals manager Ray Blades lost the confidence of his pitching staff and then he lost the confidence of the team owner. Naturally, he lost his job. On June 7, 1940, the Cardinals fired Blades and replaced him with Billy Southworth. Cardinals owner Sam Breadon made both decisions without consulting his top baseball executive, Branch Rickey. Blades had been Rickey’s choice to be manager. By firing Rickey’s personal favorite and keeping the executive out of the decision-making process, Breadon made it clear who was boss. In doing so, he damaged the relationship with Rickey. Two years later, in October 1942, Rickey resigned and became general manager and president of the Dodgers. The connection between Rickey and Blades took root in 1920 when Rickey, the Cardinals’ manager, discovered the outfielder at a tryout camp. Rickey said Blades “ran like a deer,” according to Rickey’s biographer, Murray Polner. Blades made his big-league debut in 1922. He played 10 seasons with the Cardinals and hit .301 with a .395 on-base percentage. Rickey was his manager from 1922-25. After Rickey moved into the front office, he continued to mentor Blades, grooming him for leadership opportunities. 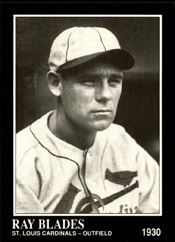 Blades was a player-coach with the Cardinals from 1930-32 before becoming a manager in the farm system Rickey built. Blades managed the Cardinals’ Columbus (Ohio) club from 1933-35 and their Rochester affiliate from 1936-38. During the 1938 season, Rickey clashed with Cardinals manager Frankie Frisch, who was a favorite of Breadon. The Cubs were wooing Rickey for their top front-office job and Rickey used their interest as leverage. Faced with the prospect of losing Rickey to the Cubs, Breadon reluctantly allowed him to fire Frisch in September 1938. Rickey selected Blades to replace Frisch. Blades led the 1939 Cardinals to a 92-61 record and second-place finish. His pitching staff had the fewest complete games (45) in the major leagues. Most starting pitchers wanted and expected to pitch complete games, but Blades had a different approach, believing a team should utilize whichever pitcher could be most effective. Because of the Cardinals’ good record in 1939, Blades’ steady use of relievers was tolerated. When the Cardinals started poorly in 1940, though, Blades’ handling of the pitching staff became an issue. The 1940 Cardinals lost six of their first eight games and 16 of their first 24. Their slugger, Joe Medwick, was miffed at Blades, pouted and went into a slump. On June 4, 1940, the Cardinals played their first home night game, but what was supposed to be a celebratory occasion turned into an embarrassment. The Dodgers scored five runs in the first inning and fans booed and threw bottles onto the field. The Dodgers rolled to a 10-1 victory. Breadon decided a change was necessary. On June 5, 1940, Breadon contacted Oliver French, president of the Rochester farm team, and arranged to meet in New York City. The Rochester club was playing a series in Newark, N.J. French called his manager, Southworth, and asked him to come to the New Yorker Hotel in Manhattan. When Southworth arrived, Breadon was there, according to Southworth biographer John C. Skipper. Breadon informed Southworth he would replace Blades. “Branch Rickey was not even informed by Breadon on either of these moves … While Breadon was away doing his plotting, Rickey was telling sports writers that no change was contemplated,” The Sporting News reported. The Sporting News, however, reported “the entire (pitching) staff was demoralized” by Blades’ handling of the starters. Southworth led the Cardinals to two World Series championships (1942 and 1944) and three consecutive National League pennants (1942-44) before resigning after the 1945 season. Blades became a coach with the 1942 Reds. After Rickey joined the Dodgers, he hired Blades, who managed the Dodgers’ St. Paul affiliate from 1944-46. Blades was a Dodgers coach in 1947 and 1948. In 1951, Blades returned to St. Louis as a coach on the staff of Cardinals manager Marty Marion. Blades also was a Cubs coach from 1953-56.